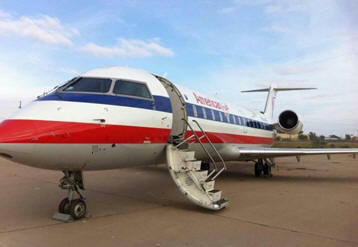 June 2, 2013 - A recent agreement with American Eagle Airlines, Inc. will give graduates of Liberty University’s School of Aeronautics more opportunities to launch their careers in the commercial airline industry. Under the new agreement, the company will hire Liberty’s qualified graduates those who meet requirements ranging from grade-point average in aviation courses to accumulated flight time for its Pilot Pipeline Program. Graduates must accumulate 1,500 hours of flight time and meet other requirements established by the Federal Aviation Administration before being hired as pilots. AEA will pay graduates to serve as certified flight instructors for the School of Aeronautics while accruing their flight time. Participants will also receive boarding pass privileges and health benefits from AEA, as well as a $10,000 scholarship upon completion of the program. Experience on the school’s CRJ 200 simulator, an advanced-jet training program, is also a requirement. The simulator will be used to screen the best candidates. “They could put it toward their tuition for their flight training costs, so it’s a great opportunity for our students,” said School of Aeronautics aviation professor Walter Reichard. Reichard estimated that about two thirds of the school’s prospective pilots will fly for commercial airlines. Currently, there are about a dozen Liberty graduates flying for either ExpressJet Airlines or American Eagle. Liberty signed a similar agreement with ExpressJet last year and is working on comparable opportunities with other airlines. The American Eagle Airlines CRJ-700 Bombardier is the type of aircraft Liberty graduates would fly upon becoming AEA pilots. American Eagle and ExpressJet are the two largest regional airline systems in the world, with nearly 4,000 daily flights to more than 200 airports throughout the United States, Canada, Mexico, and the Caribbean. “The more airlines that we can develop that relationship with and sign an agreement with, the better,” said Reichard, who retired after 15 years with ExpressJet. These agreements will be even more important as the demand rises for airline pilots, he added. “There’s a pilot shortage that is just beginning, and it’s going to continue to get larger and larger in the next 10 years,” he said. “The numbers are absolutely amazing. We’re talking 50 to 60,000 pilots they’re going to need.” The School of Aeronautics, in turn, anticipates a continued trend of climbing enrollment and an expansion of its Freedom Aviation flight operations center at Lynchburg Regional Airport. It is also exploring expansion opportunities at other airports in Virginia. The Liberty University School of Aeronautics has grown from four students to more than 700 in the last 10 years and is currently the largest faith-based university aviation program in the country. The school offers a variety of online and residential programs, including a bachelor’s degree with concentrations in military aviation, missionary aviation, commercial/corporate aviation, and unmanned aerial systems (UAS), as well as flight attendant training.